The United States Congress designated the Soda Mountain Wilderness (map) in 2009 and it now has a total of 24,707 acres. All of this wilderness is located in Oregon and is managed by the Bureau of Land Management. 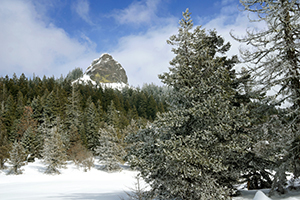 The Soda Mountain Wilderness in southwestern Oregon is an ecological mosaic where the state's eastern desert meets towering fir forests. The biodiversity of the area includes fir forests, sunlit oak groves, meadows filled with wildflowers, and steep canyons. The area is home to a spectacular variety of rare species of plants and animals including Roosevelt elk, cougars, black bears, golden and bald eagles, goshawks, and falcons. Elevations here range from approximately 3,000 to 5,800 feet. Summer months are normally warm and dry with daytime mountain temperatures reaching the 80s - 90s in mid-summer, while night time temperatures cool down to the upper 40s-mid 50s. Lower elevation, south facing exposures have been known to reach 100 degrees F and above some years. From October to April, snow covers the ground at higher elevations (above 3,500 feet) and rain falls in the valleys. Depending upon the year, snow can blanket much of mountains well into May. From May to September, rainfall tapers off and a drying trend begins with warmer days. There is a total of 8 miles of trails in Soda Mountain Wilderness. Planning to Visit the Soda Mountain Wilderness? How to follow the seven standard Leave No Trace principles differs in different parts of the country (desert vs. Rocky Mountains). Click on any of the principles listed below to learn more about how they apply in the Soda Mountain Wilderness.